Yesterday I wrote a little about the Adult Coloring Book trend (video on that link) and about the power that art and making has on Alzheimer's patients. Today I've got a great giveaway for one lucky winner. 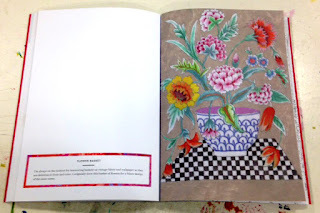 Kaffee Fassett has another new book - this one is a definite departure from his quilting books. It is an adult coloring book called Adventures in Color. It is published by Abrams Books. Most of you reading are probably aware of Kaffe's work with color and the textile arts. 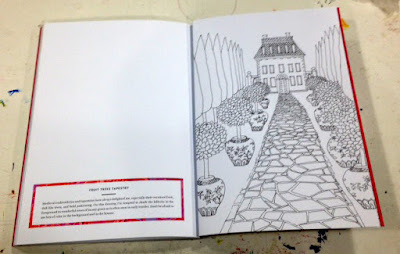 What genius for a publisher to have him do an adult coloring book! 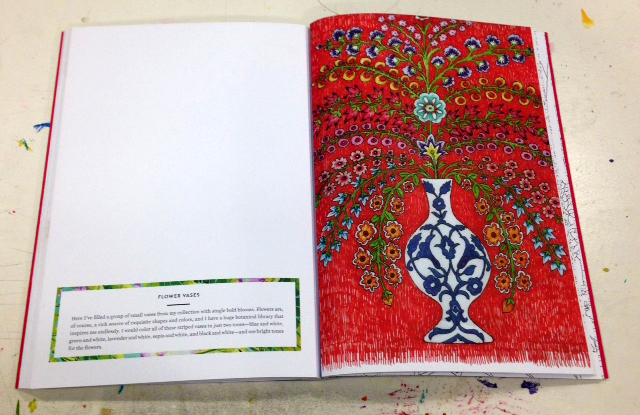 Adventures in Color is not only a coloring book for adults. Most adult coloring books are black and white line drawings bound into a book. Not this one - it is much much more. Adventures in Color includes ten tutorials from Kaffe. He shows how he works in colored pencils and markers. 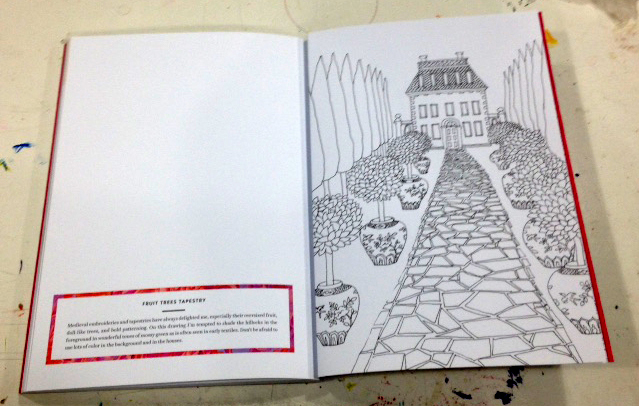 Along with the 36 blank pages for you to color, there are 10 full color already colored pages done by Kaffe. These pages give the new artist guidance. Kaffe includes Tutorials on how to work with colored pencils, do shading, think about composition and more. It's nice to see the Adult Coloring Book being taken to the next level. I hope this book does really good out there in the real world. If it does, it will bring new people into the world of art and making and drawing and creating and that is a very good thing. There are 36 black and white plates to color besides the 10 full color all ready colored plates by Kaffe. All the pages are perforated so they can easily be ripped from the book. The paper is very heavy and looks like a joy to color on. I've seen other adult coloring books and this one is so much nicer! It is widely available - it looks like even at Target. 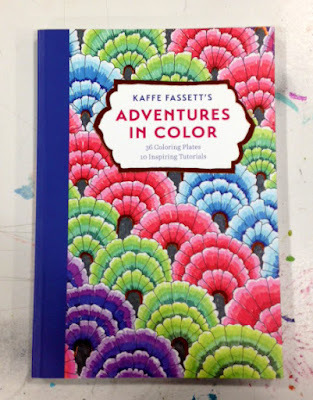 SO - here's what I have for one lucky winner today - their very own copy of Kaffe's Adventures in Color. Here's how you enter.... Answer the following question in the comments section. Do you color? 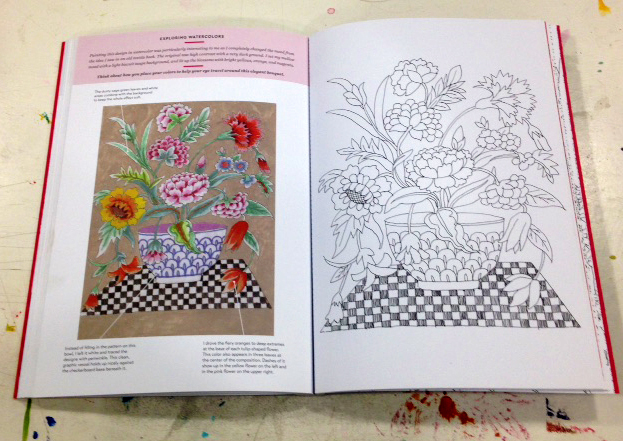 What do you think about the adult coloring book trend? Does anyone else color in your family? Do you think it will bring more people into the creative world? Any thought counts. Contest ends Monday at 11:59 p.m. US Residents only please. Please leave an easy way to get a hold of you - email, blogger or Rav id. Thanks! Have a good weekend everyone! In the early 70's, in my early 20's, my friends and brother and his friends and our mother, colored in what was then coloring books not for kids. Mostly unmemorable pictures, but required colored pencils not crayons because of the greater detail. Loved it! I Do color. I got two coloring books from Santa this year! It is a great way for me to play with colors that I might consider for knitting projects. I am a teacher and I am fascinated to watch me students of all ages enjoy coloring. What a wonderful give-away! Currently, the only thing that I color is my own drawings. That's been part of the fun of learning to draw. However, I am a fan of the adult coloring book trend. Anything that gets people to play with color, slow down, and play is a good trend to me! Also, I have seen some coloring that is truly artistic. It's sort of like knitting in that there is a craft side to it and an art side to it. Neither one is better than the other. Hopefully, it's a first step for people into the creative world!! What great giveaway...and I am a BIG Kaffe fan...I love his fabric line and have a quilt made in all Kaffe fabric in my office...love the bright colors! I think the coloring buzz is great..gives you the chance to let one side of your brain rest and the other side of your brain play. Folks will get a chance to play with colors...and have fun! I use it to audition color combinations...relaxing, inspiring and creative! Thanks for another great post and another great give away! I don't color -yet. My wife colors while I knit and it looks like so much fun. I am going to pick up a book and sone markers to take on vacation next month. Yes, I have three coloring books. I think coloring can be calming. It is a great way for me to experiment with colors and see which ones I like to have near each other. I was so happy to see this trend. I don't have to buy children's coloring books anymore! What I really love are Crayola crayons; the coloring books are just an excuse to use my crayons 😀. 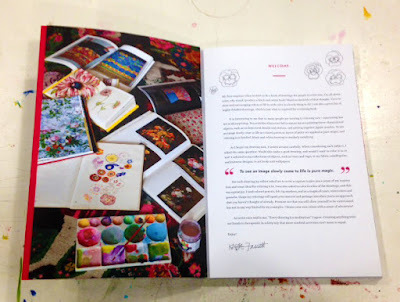 Perhaps it will lead some people to try art journaling or to try their hands at a book like Kaffe's. I think that would be great. I am definitely going to get his book. I think the adult coloring book trend is good. I think it helps some people for sure; my daughter is one. Coloring is a great stress reliever. I don't color though. I hadn't really thought about it until I read a couple of the previous comments but it really could help find colors that work together. I always think I'm not very good at 'color theory' but maybe coloring would actually help me. Kaffe's book looks awesome. . . . and also helpful for someone like me. I do have a coloring book and have done some coloring, while waiting in a hospital or for appointments, etc. But I prefer to do my own drawing and coloring or painting. I am in favor of any method to get people thinking about color and using color. I love color! And Kaffe is a big favorite of mine. 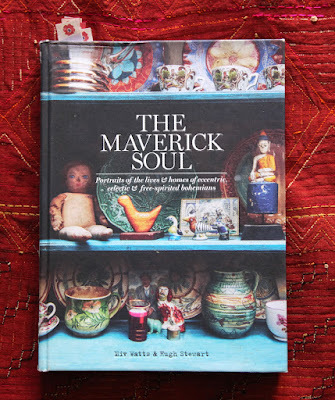 I love pouring through his books and using his fabrics. I love Kaffe Color Creations! I have yet to try coloring but would love to read his approaches to color and blending ! I do color my own drawings with watercolor and colored pencil. I used to love coloring as a child, so I was glad to see the adult coloring book movement...it makes art more accessible to everyone since the coloring books are everywhere, even in the grocery store! Kaffe's book looks like something that I would enjoy working through! Oddly, I liked adult coloring books more before they flooded the market and crowded the knitting magazines out of that section at Barnes & Noble . . . But yes, I do enjoy it and have more colored pencils than anyone would consider necessary. And I do think it will bring people to creative activity who have always thought they didn't have any talent. I wish this fad had been bigger three years ago. My mom loved to color, so each time I pass a display of coloring books I think of her. She passed away in 2014. I do think that the books are a good thing for "kids" of all ages. I think coloring is a relaxing creative outlet. People are individual and just as each person's writing is different so will be their choice of colors. What a fabulous giveaway! I have many fond memories of coloring as a child and would find this relaxing again! My mother has Alzheimer's and this Christmas I gave her a set of pencils and a vintage coloring book! I hope she can find pleasure in this activity. 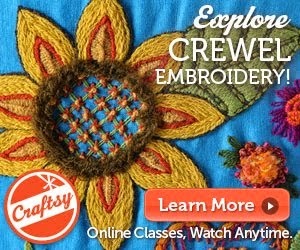 I am mamagiff on Ravelry-thanks! Hi Kristin, What a great giveaway! While I have a few adult coloring books I confess I haven't tried them yet. There are a few "mindfulness" ones out there that I think are good - though all artistic endeavors encourage mindfulness I think! When I saw this KF book I thought of my father. He has been a painter most of his life, but now he is in long term care for heart issues. He's 85, and probably won't be able to return home at this point. I think he might enjoy a book like this to pass the time (vs. watching tv!). If I don't win the giveaway I will look around for a copy! Thanks for the idea! Good luck as you prepare for lambing season and lamb races - yay! One of my favorite things in the world to do is color and has been since I was a little girl. I have a need to be creative every day and somehow invite color into my world, but at the very end of my busy days as a teacher, mother and wife, sometimes I only have enough energy to sit down with my coloring books, colored pencils and coffee and color! I think it is very relaxing and allows for some fun color experimentation. 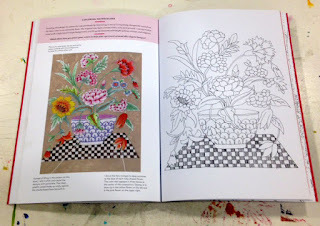 This new Fassett coloring book looks amazing! Thanks for the opportunity to win it! I haven't done any coloring yet, but i have thought about doing some. I seem to always end up with yarn and needles in my hands. I really love to knit and crochet. After reading your review on Kaffe Fassett book, you have inspired me to think more seriously about doing it. I like the concept because i have never been able to shade colors properly and i trust him to explain it. I have his knitting books and adore them. His use of color is amazing. Thanks for bringing the book to our attention. I am looking forward to reading it. I color! I'm glad there are these more intricate patterns for adults. It is a calming, sort of zen activity for me. This is a great idea to include some theory along with the patterns. I have always loved to color. One time years ago when I was a manager my team was having some issues so i brought in color books, crayons and popsicles. I told them if they were going to act like children I would treat them like that. Well they got to coloring and sharing and giggling and we finally worked out some issues. I think it is great people are coloring, it is fun and very stress free. I think everyone should color. I think color is what pulls us in to fabrics and fiber. When I'm in a knit store or fabric store I don't think about the yarn itself as I do the saturated colors - that is what I reach for with oohs and aahs. The same holds true for fabrics. I am drawn to the color first and then my creative side starts thinking "what can I create". I think coloring books for adults are the greatest and Kaffe's must be stupendous. I do not color as I seem to have missed this familial gene but do think it is a wonderful trend for all those who do find it creative and relaxing. I think this book may well be the inspiration I need to try seeing his examples and explanations. I do color and I have several coloring books as well as pens and pencils to use. I like this trend and think many people enjoy the creativity and the "living in the moment" calmness it creates in you. I don't think it will bring people into the creative world. I think people who are creative HAVE to create in some way already. One of my friends who does not like coloring worries about doing it perfectly within the lines. Another one is very practical and sees it as a waste of time. They are both quilters and are fairly creative with their quilting. I don't know what conclusion to draw from these examples, but I thought I'd put them out there. I like to color - it's what I enjoyed as a child that made me want to be an artist when I grew up. I don't spend a lot of time coloring because I like to do original art in my sketchbook, but it's a nice calming exercise without pressure. I've seen my mother, sisters and aunt all take to adult coloring books with glee - I think that's awesome that they get the same creative satisfaction that I do. Kaffe is a hero of mine - I bet his coloring book is amazing! I haven't colored yet, but I plan to... any day now. I'm not sure it will bring more people into crafting, because it's unlimited what can be done with pencils and paper. Hi Kristin, What a wonderful giveaway! Anything Kaffe Fasset puts his hand to is FABULOUS. I don't color because I'm too busy knitting but my son-in-law who has asphasia/dementia finds peace while coloring every day. He has never been creative so I see this as a wonderful cathartic expression when words fail. I'm sure whoever is the lucky recipient of this gift will be similarly blessed. Thanks for sharing your gifts with us. I enjoy coloring and often color alongside my young niece. I think adult coloring books are an awesome idea. Coloring is calming, allows us to use our creativity, and enables us to escape for a moment from the stresses of life. Yes, I color. Not all the time, but periodically I do. Sometimes it feels like I should be doing "more constructive" things, like....knitting!! I have Enchanted Forest by Johanna Basford. Love the detail work. Since hearing about the adult coloring craze I have colored a few times and find it very relaxing. I love to color! It's so relaxing! I like the adult coloring trend. It is fun and a great way to unwind. I do color. In high school, my Honors English teacher provided "coloring therapy" for students during lectures and as an alternative to sleeping in class or staring out the window-- brilliant. I am also a big fan of Kaffe Fassett and his fabrics. Had no idea this book was a thing! I love coloring and never stopped coloring with my daughter! Now we just have new books to color! I love them because you can put in so much more detail than with most coloring books for little kids! Wish it would have started sooner! First of all, Love Kaffe! I could browse his works by the hour. I am primarily a reader and a knitter but when my granddaughter comes to visit we like to color together. Thanks for the chance at this book.. Yes I just finished my first coloring book. My daughter-in-law also colors, I love all the colors. I was given a coloring book last year and really enjoyed it. I find it was a really good way to help re-focus my brain when there were too many thoughts running around my head. Kaffe's work is gorgeous in any medium. I've colored a bit, but typically prefer to knit when I have time to do something with my hands. That being said, I think this book would be fascinating. Kaffe's such a color genius that I'd love to see more about his process. Thanks! I started doing the adult coloring books a few months ago. I now have my daughter and daughter-in-law doing them too for fun and relaxation. The adult coloring books just got started at the perfect time for me. It was something I could do with friends when I had an badly injured hand. Knitting and a whole lot of other things were difficult if not impossible to do. I could also color with a friend who is mostly house bound and coloring is one activity she can do. My cousin worked with people hospitalized with mental problems and she said coloring (this was years ago) was a very popular activity with the patients. One day the new supervisor came and told the staff that they could not use coloring as an activity and that was the end of that. Only the supervisor was happy. I agree that anything that can get people creating is a real plus. One can get started with very little money and it can easily fit inside a small tote bag. There is no right way to color and there is plenty of ways to play with colors. It can be done alone or in a group. I am glad that my hand is now working and I haven't colored in ages but my coloring bag is ready and waiting. I love coloring! I'm always trying to get my fiancé to color with me when we are sitting around the house bored! He has a 6 year old daughter and when we get her in Sundays she loves to color with me! He also bought me an adult coloring book (super hero themed because I'm a nerd) and I just love it! i think the adult coloring books have brought out a lot of creativity in people lately. It's an awesome trend! I do color occasionally, but I began to miss sketching, so I'm more focused these days on re-learning how to sketch. I only wish I have more time to practice. 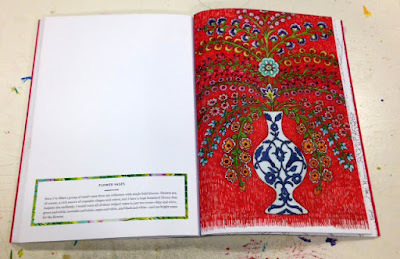 The Fassett book looks awesome! I haven't colored in awhile but I enjoy it. My grown daughter who has been sick enjoys coloring 2 relax with her two sons. Coloring seems very popular for adults nowadays. I enjoy adult coloring books. It is a little me time and it relaxes me. I like to color while I watch TV at night. It keeps my hands busy and it's very relaxing. My granddaughter is the only other person in the family that colors -- when she visits we spend time together coloring the same page while we chat. I color with my granddaughter and it gives us lovely quiet, non-screen time to chat about her day. I like to have something creative in my hands to do. This book looks lovely. I love to color and in fact, I have gotten my entire family into it. My and I color everyday while watching some tv at night! Thanks for the chance to win. I started coloring as an adult about a year ago. I love it! I find it so restful, especially at night. I like to listen to my favorite music and color. Yes I do adult coloring, and I love the new trend.My mother in law does it as well, and she is actually the one who got me started. I think it brings out the artist in us all. I love the adult coloring book trend. I love to color and love to see my creations. I have not gotten into the coloring craze. Honestly, I am just too busy, but I have friends who do color and they absolutely love it. I stopped coloring a very long time ago, but maybe with KF's hand-holding, I'd try it again! I have just started coloring. It is a great way to wind down at night for me. I'm not great at it, but I do enjoy it. I know some creative people that are really into it. Thanks! I love coloring with my kids. My preschoolers love coloring in the adult books as well. I'm 52 years old and never stopped I think coloring, I just did it in secret. Coloring is easy to do and can be done without to much expense or time. I still love coloring with my kids. Thank you for the giveaway, Kristin! I do some coloring, but always feel like I should be doing something more productive! My sister colors, and it's a great stress relief for her. I think coloring is a great trend, no matter what the reason a person colors! Open need to watch some mainstream on facebook or on any web based systems administration regions. Regardless, not every post is viral in light of the way that the couldn't get most extraordinary points of view. In case you have most extraordinary viewpoints then your post would be considered as viral. I will progress advance Get views on facebook video and serving in fiverr from a year prior.